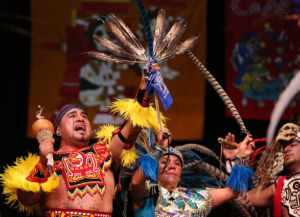 2017’s Día de los Muertos (Day of the Dead) brings together more than 30 community altars, a colorful tapete (sand painting), traditional foods, Aztec dancing, mariachi, artmaking, and more! Create a keychain inspired by traditional Día de los Muertos images, such as sugar skulls, marigolds, la Catrina, and more. As a nod to her own work, artist Teresa Martinez will guide you through the process of creating the keychain with shrink plastic. Teresa Martinez grew up surrounded by Mexican and Latin American culture is drawn back to her roots through her artwork. Teresa creates colorful Aztec bowls, cups, shirts, earrings, necklaces, and more. Visit etsy.com/shop/amanoseattle for more information. Dabble in printmaking with artist Roberto Sanchez, taking inspiration from traditional Día de los Muertos imagery and Jose Posada! Roberto B. Sánchez, a son of migrant workers, grew up listening to the stories and history of his family in the fields of Eastern Washington. 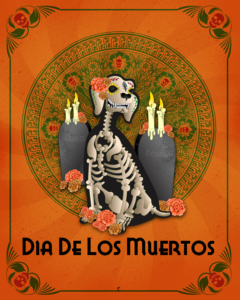 Though he has met many challenges in life, he always remembered to honor his family and his ancestors by celebrating Día De los Muertos. He loves to share the stories of his ancestors to keep them alive and pass their stories onto the next generation. Visit www.robb.sanchez.com for more information. 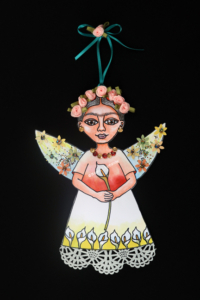 Create a colorful Frida ornament! 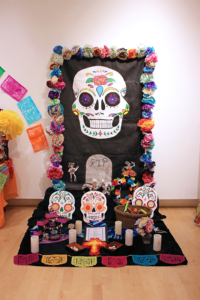 Using traditional Día de los Muertos imagery of calaveras (skulls), artist Blanca Santander will guide you through the process of creating mixed media, textural ornaments of one of the most beloved Mexican artists. Visitors can also choose to make their ornament in the likeness of a friend or loved one. As a communicator and part of the Latino community of the Northwest, artist Blanca Santander shows her heritage through painting. She believes in and shares in the world’s necessity of compassion, love, and environmental defense. Her paintings are intimate, spiritual, and feminine, often reflecting connections to Pachamama, or Mother Nature. Visit blancasantander.com for more information. 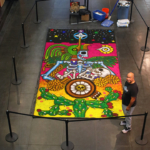 “Huitzilopochtli Guided Us” – Diaz’s tapete design is dedicated to all “Dreamers”. Depicted as a hummingbird, the Aztec god Hutzilopochti told all Mexicans to find the promised land, to break free and conquer. Guided and strengthened in most cases by the love of their family and by the hope of a better future for their kids and loved ones, migrants cross many barriers in pursuit of better life conditions. Diaz’s tapete design is a small tribute to those kids. 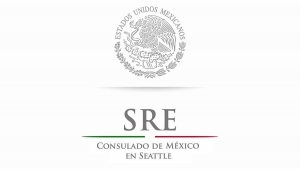 Community altars coordinated by Proyecto MoLE. Face paint generously provided by Coordinated Care; face painting coordinated by Jesenia Ifie, Centro Latino, and Shimmered Alicorn. Día de los Muertos Free Community Festival t-shirts generously sponsored by Custom Shirt Shop.